Modeling users’ online behavior has great benefit for many e-Commerce web sites and search engines. In the context of software service selection, if we could understand users’ personal preferences, we could rank the services in a more satisfactory way. Many users have some general preferences on the desired values of non-functional properties (e.g. provider history, service popularity, etc.) 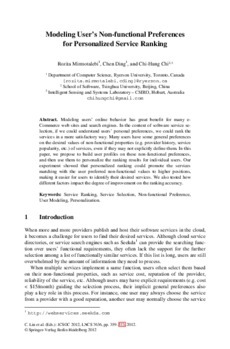 of services, even if they may not explicitly define them. In this paper, we propose to build user profiles on these non-functional preferences, and then use them to personalize the ranking results for individual users. Our experiment showed that personalized ranking could promote the services matching with the user preferred non-functional values to higher positions, making it easier for users to identify their desired services. We also tested how different factors impact the degree of improvement on the ranking accuracy.